This Section is a transcription onto the Website of the book "The Infantry Regiments of Surrey", which was published on 1st June 2002, to commemorate the Battle of that date in 1794, and to mark the Tercentenary of the Raising of Villiers Marines in 1702, later the 31st Foot and The East Surrey Regiment. The book describes the progress of the regiments from the formation of The Tangier Regiment in 1661, later the 2nd Foot and The Queen's Royal Regiment, up to The Princess of Wales's Royal Regiment in 2002, by reference to notable Actions and other events in their history. The book is profusely illustrated with colour plates depicting the uniforms, arms, accoutrements and colours worn and borne by the soldiers down the years. The text was written by Lieutenant Colonel Les Wilson, MBE, and Lieutenant Colonel Patrick Crowley, both of whom are members of the Regiment and noted military historians. The colour plates and some black and white prints are taken from paintings and illustrations by Bryan Fosten, once a soldier himself, but known for his eminent research of military uniforms and his writings and paintings on this (and other) subjects. Bryan Fosten has been a prolific contributor to Regimental publications for many years. 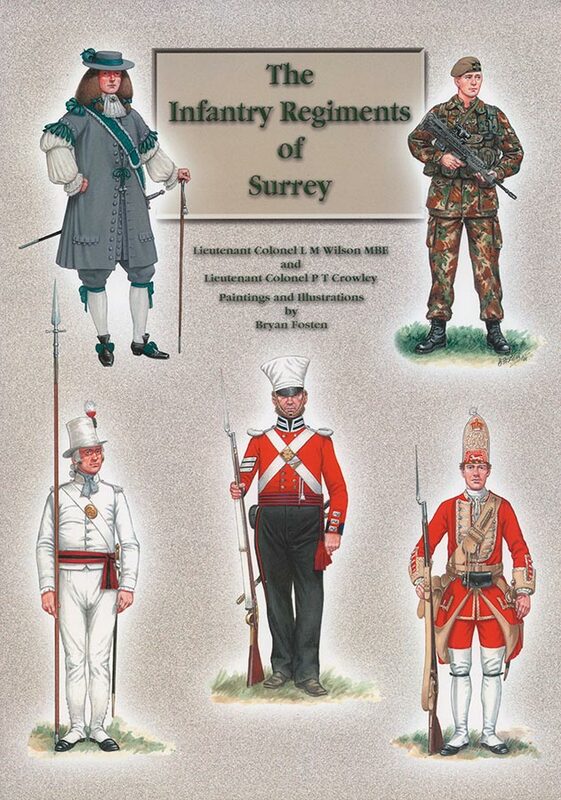 The Infantry Regiments of Surrey was published jointly by the Trustees of The Regimental Museum and the Trustees of The Queen's Royal Surrey Regiment Territorial Trust. Copies are held at The Surrey History Centre, in Woking, and at The Surrey Infantry Museum, at Clandon Park near Guildford.